The Rolling Stones have released a second new recording entitled One More Shot from their recent Paris sessions, It follows on from last month’s release of Doom & Gloom. Both songs were recorded for inclusion on a 50th anniversary hits compilation, GRRR!, out next week, and it’s a relief to report that they won’t sound out of place amongst the veteran band’s many classic hits. Whereas Doom & Gloom, written by Jagger, had an energised, up-tempo blues sound with a vaguely political lyric, One more shot, written by Keith Richards, is a classic variation of the kind of thing the Stones have been playing for half a century. It’s a little bit Jumping Jack Flash and a little bit Start Me Up, driven along by Charlie Watts simple but swinging beat and a Country inflected solo from Ronnie Wood. It just sounds like a bunch of great musicians in the studio rocking out for the sheer joy of it. Today Google has been marking the birth date of Author Bram Stoker, so I thought I would watch a few Vampire movies including the classic Silent 1922 German horror film, Nosferatu. Directed by F. W. Murnau and Released in 1922, Nosferatu is a based on the story “Dracula by Bram Stoker and features a young Clerk named Thomas Hutter who is dispatched by his employer Knock (Stoker’s Renfield) to visit a mysterious new client named Count Orlok (Max Schreck) in Transylvania in order to finalise the sale of a property. Whilst he is absent he entrusts his loving wife Ellen (Stoker’s Mina Harker) to his good friend Harding (Stoker’s Arthur Holmwood) and Harding’s sister Annie (Stoker’s Lucy Westenra), before embarking on his long journey. Nearing his destination in the Carpathian mountains, Hutter stops at an inn for dinner. The locals become frightened by the mere mention of Orlok’s name and discourage him from traveling to his castle at night, warning of a werewolf on the prowl. The next morning, Hutter takes a coach to a high mountain pass, but the coachmen decline to take him any further than the bridge as nightfall is approaching. A black-swathed coach appears after Hutter crosses the bridge and the coachman gestures for him to climb aboard. Hutter is welcomed at a castle by Count Orlok. The morning after Hutter wakes up to a deserted castle and notices strange bites on his neck, which he attributes to mosquitoes or spiders. That night, Orlok signs the documents to purchase the house across from Hutter’s own home. Hutter writes a letter to his wife and gets a coachman to send it. Reading a book about vampires that he took from the local inn, Hutter starts to suspect that Orlok is Nosferatu, the “Bird of Death,” then his door opens by itself and Orlok enters…. The next day, Hutter later manages to escape Orlok’s castle through a window, but injures himself, When he recovers sufficiently he hurries home. Meanwhile, the coffins are shipped down river on a schooner and soon all but the captain and first mate are dead. Then when the ship docks Orlok disembarks carrying one of his coffins, and moves into the house he purchased. when the ship’s captain is found dead people assume they are dealing with the plague. soon many more unexplained deaths follow, the town is stricken with panic, and people are warned to stay inside . Meanwhile Hutter’s wife Ellen thinks she may have discovered a way to defeat the vampire and opens her window to invite him in…. After a rough sea voyage to London aboard the Demiter, during which all of the crew mysteriously vanishes. The Count arrives safely and moves into his new residence at Carfax Abbey. Soon after this, an alarming number of people start mysteriously Dying in the area including a young woman named Lucy Weston who becomes an undead vampire. Dracula then turns his attention to her friend Mina Seward, daughter of Dr. Seward who then calls in a specialist, Dr. Van Helsing, to diagnose the sudden deterioration of Mina’s health. After finding strange marks on Mina’s neck, Van Helsing, starts to suspect that Count Dracula may indeed be a vampire and sets out to prove it whilst trying to prepare Mina’s fiance, Jonathan Harker, and Dr. Seward for what is to come and the measures that will have to be taken to prevent Mina from becoming one of the undead should Count Dracula actually be a vampire. The fourth album by the English rock band Led Zeppelin was released on 8 November 1971. No title is printed on the album, so it is usually referred to as Led Zeppelin IV, following the naming standard used by the band’s first three studio albums. The album has alternatively been referred to as ZOSO, Four Symbols, The Fourth Album (those two titles each having been used in the Atlantic catalogue), Untitled, Runes, The Hermit, and ZoSo, the latter of which is derived from the symbol used by Jimmy Page for the album sleeve. Page often had the ZoSo symbol embroidered on his clothes. Performed by the remaining members Robert Plant, Jimmy Page John Paul Jones plus Jason Bonham (son of Zeppelin’s late drummer John, who died in 1980). Celebration Day is tight, punchy and unrelenting. During the show the band members were conscious that it may be the world’s last chance to see Led Zeppelin performing together and it was a critical to get it right because they only had one shot at it. Despite persistent rumours which surrounded the gig the band members have so-far avoided questions about whether they will ever again reunite. While a student Stoker became interested in the theatre & became the theatre critic for the Dublin Evening Mail, co-owned by the author of Gothic tales Joseph Sheridan Le Fanu. After giving a favourable review of Henry Irving’s Hamlet Irving invited him to dinner and the two became friends. Stoker also wrote stories, and in 1872 “The Crystal Cup” was published by the London Society, followed by “The Chain of Destiny” in four parts and “The Shamrock”. while a civil servant in Dublin, Stoker wrote a non-fiction book (The Duties of Clerks of Petty Sessions in Ireland. Stoker was also interested in art, and founded the Dublin Sketching Club. In 1874 The Stokers moved to London, where he became acting manager and then business manager of Henry Irving’s Lyceum Theatre, London, a post he held for 27 years. The collaboration with Irving was important for Stoker and through him he became involved in London’s high society, where he met James Abbott McNeill Whistler and Sir Arthur Conan Doyle (to whom he was distantly related). Working for Irving, the most famous actor of his time, and managing one of the most successful theatres in London made Stoker a notable if busy man. He was dedicated to Irving and his memoirs show he idolised him. 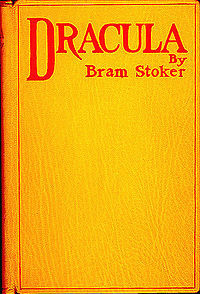 In London Stoker also met Hall Caine, who became one of his closest friends – he dedicated Dracula to him.In the course of Irving’s tours, Stoker travelled the world, although he never visited Eastern Europe, a setting for his most famous novel, and began writing novels beginning with The Snake’s Pass in 1890 and Dracula in 1897. Stoker was also part of the literary staff of the London Daily Telegraph and wrote other fiction, including the horror novels The Lady of the Shroud (1909) and The Lair of the White Worm (1911). Stoker also met Ármin Vámbéry who was a Hungarian writer and traveler and the story may have been inspired by Vámbéry’s dark stories by Carpathian mountains. He also spent several years researching European folklore and mythological stories of vampires as well as visiting Whitby Abbey, Slains Castle in Aberdeenshire and the crypts of St. Michan’s Church in Dublin and also read the novella Carmilla by Joseph Sheridan Le Fanu. Sadly After suffering a number of strokes, Stoker passed away on 20 April 1912 and was cremated at Golders Green Crematorium where his ashes were place in a display urn . To visit his remains at Golders Green, visitors must be escorted to the room the urn is housed in, for fear of vandalism.